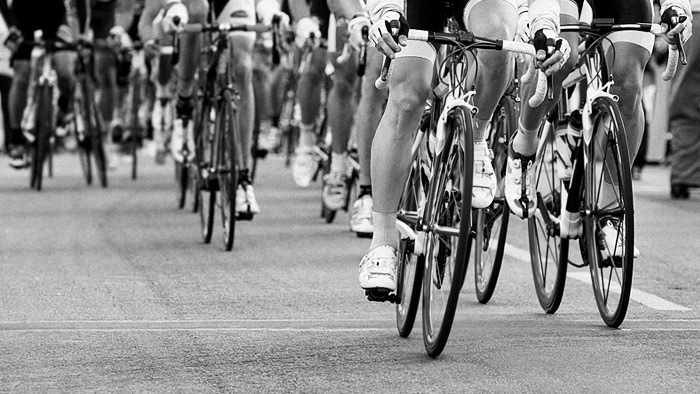 A criterium, or crit, is a fast-paced ever challenging bike race. Most crits are held on a closed circuit and contain multiple turns, short but fast straight-aways and maybe even a short hill. To be competitive in a crit you have to have multi-faceted training. A well trained crit racer has an arsenal of skills at his or her disposal. In a typical crit, any one of the following, if not all, could be required of you; multiple accelerations out of corners, putting out super hard efforts to bridge gaps, and producing an all-out effort for a sprint finish. Each one of these exertions should be trained individually. If there is a break of riders up the road and it looks like it is going to stay away until the finish, you NEED to get up there. But you DON’T want to bring the whole pack with you, otherwise you are back to square one. There are two options. One, go across alone or two, bridge with a few other riders. In either case you will be required to ride harder and faster than the break up the road and the group you just left. If the gap is small, your exertion will be short and sharp. If the gap is significant, you will need to pace your effort. Go too hard during the bridge and you risk blowing up. Put in the right effort and you are now in the lead group. How do you prepare to produce an effort above and beyond that which you were doing during the race? Of the different types of criterium training, bridging the gap has the longest effort segments. Doing what I call plus intervals will help prepare you to bridge the gap in a race. Please note that before doing any efforts listed, you should always warm-up. Fifteen minutes of steady pedaling. Then do 3 x 60 second high spin efforts at 100+ rpm with 2 minute recovery between each and after the last. You should also know your current Functional Threshold Power (FTP) to hit the right targeted zones. In your typical four corner criterium of 40 minutes, you could essentially be jumping out of every corner. Depending on pace, etc., that could be more than 80 separate short efforts. That means a lot of matches burned. Training to accelerate out of corners throughout a race requires a mid-range effort segment. An effective way to train your body to produce an all-out effort over and over again is using the one on/one off workout. The one on target is 150 percent of your FTP. The one off is a minute of soft pedaling to recover as quickly as possible. Start by doing 10 reps of one on/one off. Once you are no longer able to hold two consecutive 1 minute efforts at 115 percent of FTP, you should put an end to the effort session. Do these once per week, preferably with 3 or more days before your next race. Your goal is to be able to produce 30 of these in a row with minimal power loss between the first and last effort. Two 1 minute efforts – out of the saddle for the first 15 to 20 seconds then back to seated position to complete the effort. Hands on drops, all pedaling motion being down from the hips down. Every third effort – out of the saddle for the entire minute. Hands in the drops, all pedaling motion from the hips down. Repeat until you can no longer hold 115 percent of your FTP. The final phase and shortest phase for a crit training program is sprint training. You have successfully made it to the end of the race, now it is time to sprint. Here, you need to break sprint training into two separate phases. The first phase is working on your burst, or getting up to speed through what I call stand stills. The second phase is working on your top-end, or maintaining the speed needed to cross the finish line first through rolling sprints. Stand stills are drills designed to solely work on building the ability for you to get up to speed quickly. You will need a straight and flat section of road that is at least 400 meters long. Finding a quiet road with little traffic is ideal. Measure off a 200 meter section. This will be where you do your sprints. Use some sort of marker to indicate your start and finish line. In the past, I have used everything from natural landmarks to drawing chalk lines on the road. You will be going back and forth on the same section of road. Start at one end, sprint for 200 meters, coast for 10 to 15 seconds then return to your starting point to repeat. Your first two sessions should be in a slightly easier gear so that your body adapts to the workout and is not stressed by pushing a big gear. Do 3 sets of 4 Stand Stills. The objective is to build to the point of doing the stand stills in your 53 X 12 or 50 X 11. These sprints work on your top end speed. These can be done by doing loops on the same section of road mentioned above or on a continuous flat section of road. For each sprint you go for 20 seconds then recover for 1:40. Repeat four more times to complete one set for 10 minutes in length. Recover for five minutes between sets. Repeat three to four times. While not all criterium courses will require you to use all of these types of efforts, the specific training will increase your power, strength and speed overall. In the long run, you will be prepared you for all types of crits that come your way. O'Brien Forbes, aka, Coach OB, is a full time cycling coach based out of Cincinnati, Ohio. He has been racing since 1986 and has been a Cat. 1 since 1995. He works with all levels of cyclists from the club rider to Cat. 1 racers. His riders have earned multiple state champion jerseys in TT, MTB, CX, road and crit. Learn more about Coach OB here www.coachob.com or ask him a question at coachob@coachob.com.